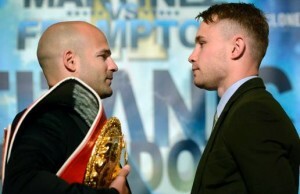 Kiko Martinez Vs Carl Frampton… Revenge Or Destiny. Spain’s Kiko Martinez (31-4, 23koes) defends his IBF world super-bantamweight championship against Belfast’s Carl Frampton (18-0, 13koes) this Saturday, September 6, at The Titanic Quarter, in Belfast, Northern Ireland, in a fight that is expected to live up to the name of its venue. This is the second time that these two men have met, the first being on February 9, 2013, when Frampton handed Martinez the only stoppage defeat of his career in the 9th round of what had been a furious contest, and wrested away Martinez’s European title in the process. In the eighteen months since their first encounter, Frampton has been relatively quiet, fighting twice, while Martinez, in an ironic twist often found within boxing, rebounded from the Frampton defeat to win the IBF world championship in Atlantic City, with an upset victory over previously unbeaten Jhonatan Romero. Since winning the IBF title last August, Martinez has not been content to rest on his laurels and has already made two successful defences, stopping Jeffrey Mathebula in 9 rounds, and Hozumi Hasegawa in 7 rounds. Martinez is a real Spanish hardman, who seems to have been around forever. After turning professional in 2004, Kiko first won the European title in 2006. There have been ups and downs along the way, but Martinez is a throwback to the old school fighters, who learned from their setbacks and came back stronger. 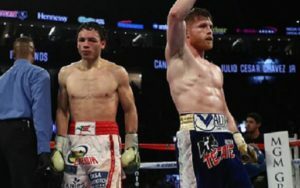 Many fighters would have been disillusioned following the kind of defeat that Martinez suffered at the hands of Frampton in their first encounter, but Martinez came back, and grabbed his unexpected world title shot with both hands. Kiko is no stranger to Irish fans, having stopped a previous Irish hero Bernard Dunne, in one round back in 2007, in defence of his European title. Dunn went on to win the world title himself, but Martinez’s first round demolition of him was something that he never forgot. In the years since then, Martinez lost twice to England’s Rendall Munroe, in 2008 and 2009, but has proved himself to be a survivor, and so far, has come back from every career defeat seemingly stronger, and more determined. Perhaps the most surprising thing about the champion is that despite his veteran status he is at 28 only one year older than his challenger. When he faces Frampton this weekend, Martinez will find himself in the unusual situation for a defending world champion, of being the significant underdog, based on the result of the pair’s first fight. But, this may actually be an advantage for the defending champion, as much of the pressure in this contest seems to be weighed upon the challenger, Carl Frampton. Since turning professional in 2009, Frampton has been almost immaculately guided by manager Barry McGuigan, a former world featherweight champion, and still an idol in Ireland. McGuigan has taken Frampton along step by step, judging each step up in class to perfection. The relationship between the two seems to be far closer than that of most managers and fighters, and this is underlined by the fact that Frampton’s trainer is Mcguigan’s son, Shane. Now Frampton stands on the pinnacle of genuine stardom, which winning the IBF title from Martinez would bring him. Frampton is already a huge box office in Ireland and a repeat victory over Martinez this weekend will take his popularity and marketability to the next level. Yet, Frampton will do well not to take success as a foregone conclusion against the defending champion. When the pair fought for the first time last year, the fight was close right up until the finish, when Frampton came up with a spectacular combination to drop the previously never stopped Martinez. The fight had started with Frampton out-boxing the bull-like Martinez, but as the rounds progressed, the rugged Kiko got closer and closer to Frampton, drawing him into the kind of close quarters encounter at which he excels. 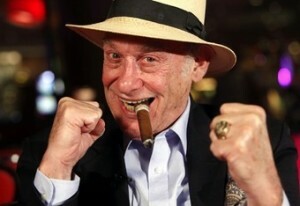 On Saturday, Frampton will have to watch being drawn into a toe-to-toe war, as this would favour the ultra-fit Spaniard. 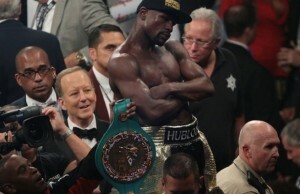 Winning a world title often improves a fighter and Martinez has shown signs of this since beating Romero for the championship. Martinez is an aggressive come-forward fighter, who is most at home fighting on the inside. Although often known to be dangerous early in fights, Kiko has also shown that he has the stamina to come on strong late. Frampton is undeniably the better all-around boxer of the two men, being able to box on the retreat or slug it out. Frampton has a good jab and a stinging punch, which he uses to good effect with excellent ring mobility and impressive hand speed. As pure talent goes, Frampton heads into this fight with a significant edge, yet, success in boxing often comes down to something much rawer and less subtle than pure talent. One of the advantages that Martinez may have over Frampton is the fact that he is far more battle hardened than the Belfast man. Martinez remains the toughest fighter that Frampton has faced, and this Saturday, with a world title to defend, Martinez may well be even tougher than he was 18 months ago. As rematches go, this has the appearance of being a very ‘live’ fight. Frampton needs to stick to a similar game plan that he had during their first fight, using his superior boxing skills and ring movement to pile up the points, and stay out of harm’s way. 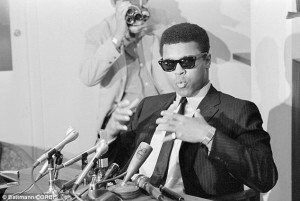 If he elects to stand his ground early with the champion, then he could be making a grave mistake. The challenger will have most of the Belfast crowd behind him, but this is unlikely to phase Kiko, who has spent much of his career fighting in his opponent’s back yards. The challenger, on the other hand, needs to make sure that having a crowd of 16,000 cheering him on, at the purpose built Titanic Stadium, does not make him over emotional or too ambitious. Frampton needs to keep his focus and make sure that the crowd does not affect him adversely. In many ways this looks to be Frampton’s fight to lose, rather than Martinez’s fight to win. Frampton has already proved that he has the tools to beat Kiko, but the champion also has the ability to turn things around and upset the Frampton applecart, should the Belfast man start taking things for granted. Frampton’s nickname is “The Jackal” which is ironic, as there is another Jackal in the super-bantamweight division, who is viewed by many in boxing as the true world champion, irrespective of who wins between Frampton and Martinez this Saturday. Guillermo Rigondeaux who holds the WBA and WBO titles, is a name that does not appeal to many 122-pounders, so perhaps it should be no surprise that both Frampton and Martinez seem to be in no hurry to share the same ring as the Cuban born virtuoso. 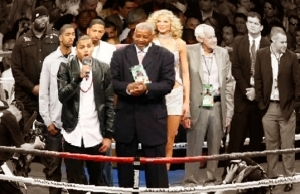 Once upon a time in boxing world, champions decided the challengers that they would defend their titles against, today, the challengers decide which champions they will challenge. The truth is that Frampton and the other top super-bantamweights don’t need to risk their records against Rigondeaux when there are other world titles to take, against less elusive and complicated opposition. There is no love lost between Martinez and Frampton. Martinez said, in the run up to this rematch, that this is the match he has wanted ever since he won the world championship, as he wants to prove himself the better man and avenge his loss of 18 months ago. Frampton, on the other hand, feels that it is his destiny to win on Saturday, and begin what he hopes will be a run of success to rival that of his manager and mentor, McGuigan. Revenge or destiny. On Saturday, Carl Frampton should edge out the tough guy from Spain with his superior skills and leave the ring with Martinez’s world title belt around his waist. The question of whether such a victory will make Frampton a genuine world champion is likely to matter little to the 16,000 fans that will be cheering him to victory.